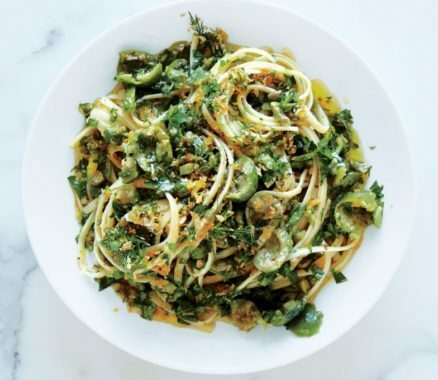 Linguine with green olive sauce and zesty breadcrumbs: Our ‘pasta-peep’ Kathy, has done it again with this winner of a recipe from Chris Morocco, Senior Food Editor at Bon Appetit in June, 2015. Time to revive it! 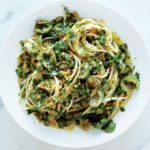 We love this recipe for linguine with green olive sauce, for it’s unbound fusion of different cultures. Japanese meets Italian-ness. If you can find or prepare anchovies under oil like the ones in our recipe, use them. They are very different and more delicately flavoured and texture than some of the ones you find in those small jars. Heat 1 tablespoon oil in a medium skillet over medium and cook panko, stirring, until golden, about 5 minutes. Season with salt and pepper; transfer to paper towels to drain and toss with dill and lemon zest. Meanwhile, mash anchovies and garlic to a paste on a cutting board with the side of a chef’s knife. Combine with parsley, basil, and half of olives and capers in a large bowl. Chop remaining olives and capers and add to bowl, along with remaining 1/2 cup oil. Mix well; season sauce with salt and pepper. Sauce can be made 1 day ahead. Cover with plastic wrap, pressing directly against surface, and chill.